Keratin is everywhere! Be it in magazines or on social media or the TV – everyone is talking about this miracle protein. Why are people going gaga over it? How does it help your hair? Scroll down to find the answers to these questions. 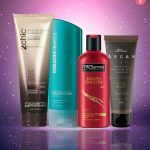 We have also compiled a list of the 10 best keratin shampoos that will help you achieve healthy and shiny hair. Let’s get started! Keratin is the protective protein that makes up most of your hair. Technically, it is the structural building block of your hair. It plays a significant role in strengthening and softening your hair and keeping its elasticity intact. 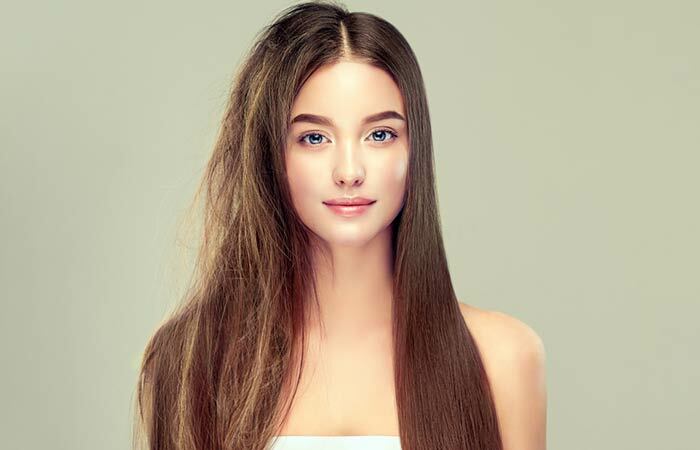 But, here’s something you need to know – the keratin in your hair can get depleted with excessive use of styling products, chemical treatments, and heat styling tools. Now, let’s take a look at how keratin functions. 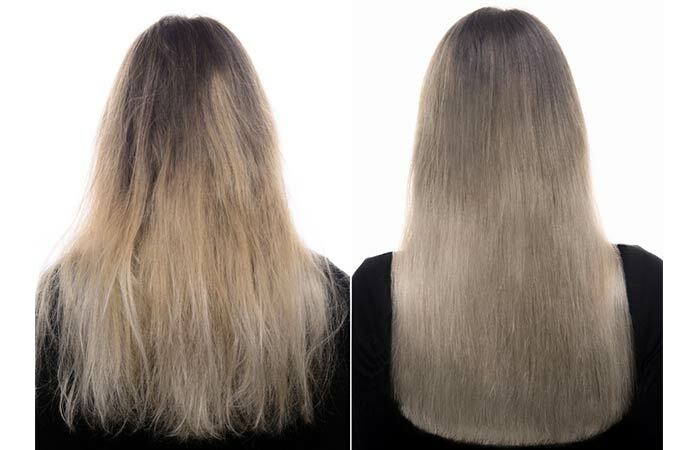 Keratin works differently on different hair types. It makes your hair smoother and easier to manage. It reduces damage by smoothing down the hair cells that overlap and cause breakage. Your hair cuticles absorb keratin and make your hair look straight and silky. It also forms long peptide chains that strengthen your roots. Ultimately, it determines the structure of your hair type. Once the keratin bonds are broken, they turn water-soluble and are washed away. This is why keratin shampoos and treatments have started popping up to retain the keratin in your hair follicles. But the question remains – how exactly does keratin give you silky hair? Here’s what you need to know. How Does Keratin Help You Get Healthy And Silky Hair? Keratin helps in rebuilding the structure of your hair by filling porous spots in your cuticles with proteins. This makes your hair soft and silky and maintains the moisture levels in it. It also makes curly hair less frizzy and more manageable. 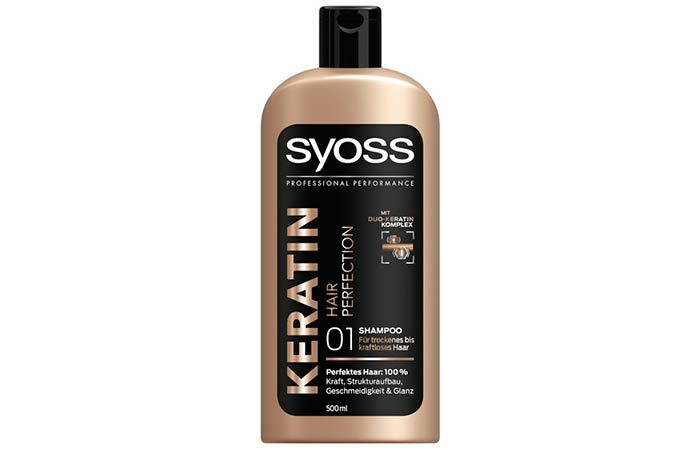 Now that you are up to speed with all that you need to know about keratin, let’s check out the top 10 keratin shampoos you can get your hands on right now. 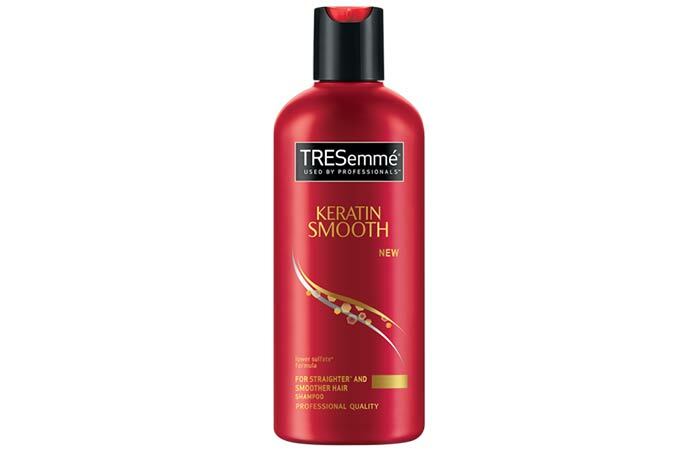 Tresemme Keratin Smooth Shampoo is specially formulated to restore keratin in your hair and leave it looking gorgeously straight, silky, and manageable. 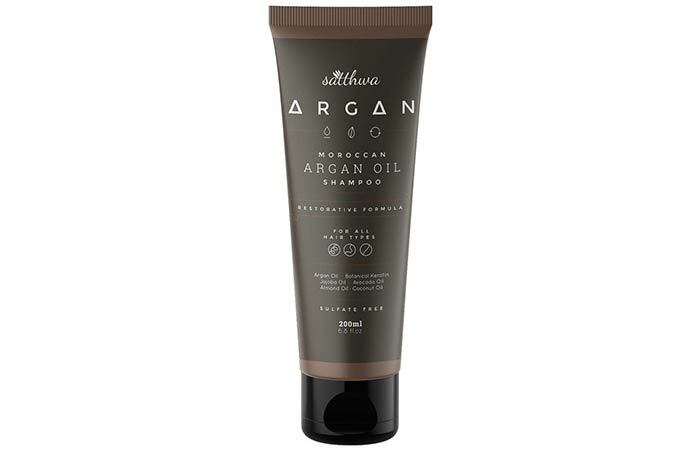 It contains argan oil that repairs damaged tresses and tames unruly hair. It promises to tackle split ends and reduce breakage. It also improves the texture of your hair and keeps its color intact. It claims to control frizz for up to 48 hours. 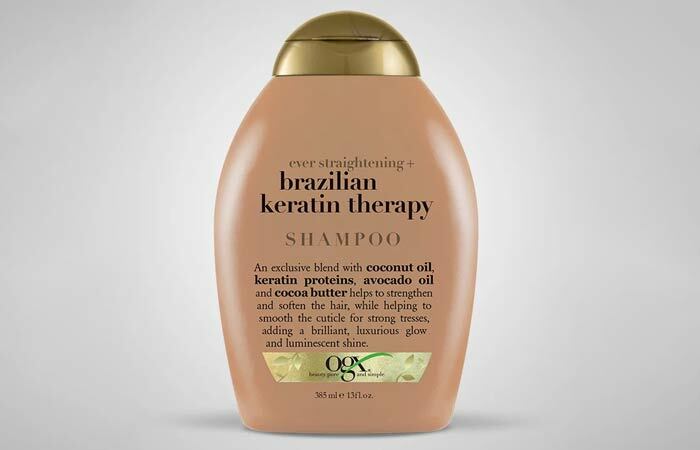 OGX offers this keratin therapy shampoo that contains a rich blend of coconut oil, avocado oil, keratin proteins, and cocoa butter that strengthen your hair and make it soft. This shampoo also contains nourishing properties that help in strengthening your hair follicles from within. It also curbs dryness and minimizes split ends. It is especially great for curly hair as it makes your hair more manageable and easier to detangle. This shampoo is a blend of keratin, wheat, and soy proteins that help in conditioning dry locks. As it does not contain any harsh chemicals, this shampoo stands close to being a perfect product that can make your hair resilient, smooth, and shiny. 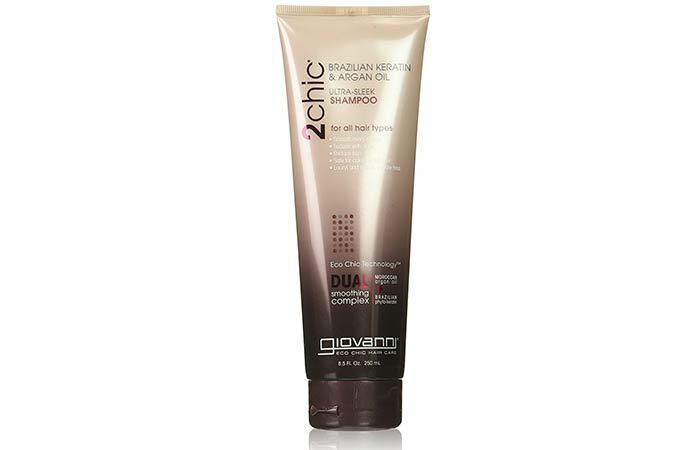 It is formulated without sodium chloride to make the effect of keratin treatment last longer. It also restores strength to dry and damaged hair. If you are suffering from breakage and split ends, this shampoo can work wonders on you. Are you suffering from thinning hair? Here’s a shampoo that can help you out. 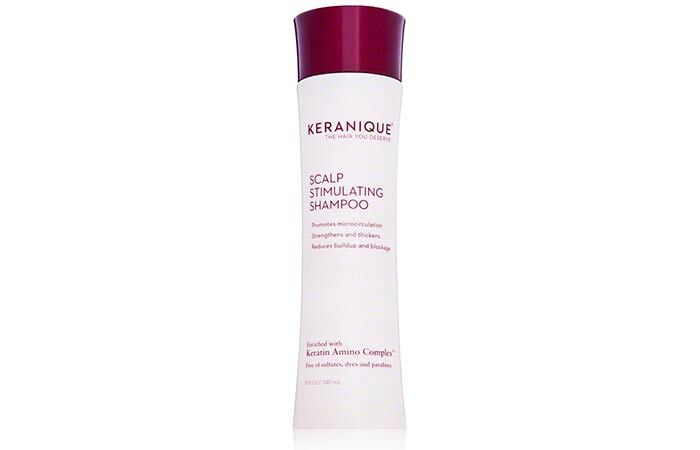 Keranique Scalp Stimulating Shampoo is designed to nourish and rejuvenate thin and limp hair. Infused with keratin and pro-vitamin B5, this shampoo gently cleanses your scalp by removing impurities and pollutants. The ginseng root extracts in it strengthen hair follicles and prevent breakage. It also contains advanced amino acid keratin complex (that strengthens and thickens hair cuticles) and peppermint oil (that helps remove any hormonal toxins that may lead to hair loss). This shampoo contains luxurious ingredients like Moroccan oil and Brazilian phyto-keratins that smoothen every hair strand efficiently. It adds glossy radiance to your hair and tames unruly wild tresses. This smoothing shampoo contains jojoba seed extracts, aloe vera, and coconut oil that help in nourishing and moisturizing dry strands. It also contains a dual smoothing complex with plant-based extracts that improve the elasticity of your hair. It even adds vibrancy to dull and limp hair. 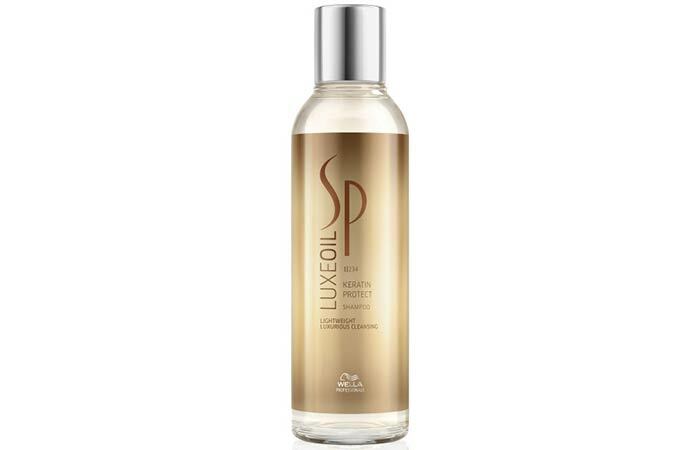 Wella SP Luxe Oil Keratin Protect Shampoo provides absolute care to your tresses by gently cleansing away all impurities and oil build-up. This shampoo contains keratin and panthenol that penetrate into your hair follicles to enrich them with water molecules and hair proteins and add strength and resilience. It also contains jojoba, almond, and argan oils that enhance your hair and impart natural shine to it. The conditioning properties of this shampoo help in nourishing your locks and making them visibly soft and shiny. This shampoo contains a keratin primer that helps in smoothing down your hair fiber. It revitalizes dry and limp hair and makes it healthy and shiny. It repairs damaged locks with its nourishing properties and tackles split ends. It uses keratin to strengthen your hair from within. It also improves your hair texture within a couple of washes. This shampoo contains botanical keratins along with argan oil, jojoba oil, neem extracts, and almond oil. It keeps your hair soft and moisturized. It also strengthens your hair and minimizes breakage. It tackles split ends and dryness by conditioning damaged tresses intensely. It also restores strength and resilience to your hair. Besides conditioning, it also nourishes your scalp and improves your scalp health. The unique blend of ingredients helps in boosting the hair regrowth process and preventing premature graying. 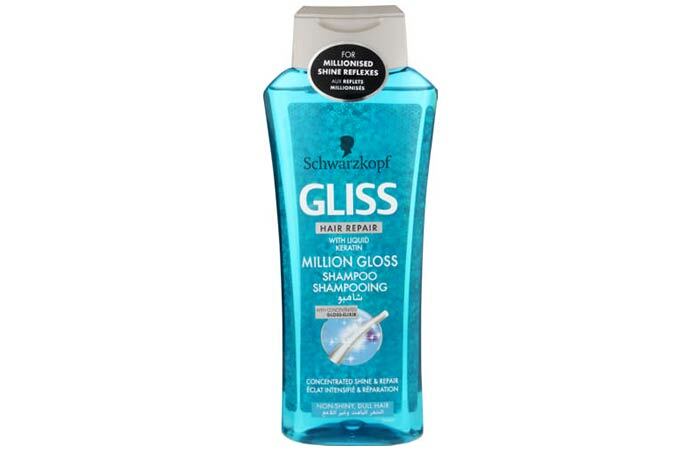 Schwarzkopf Gliss Million Gloss Shampoo is formulated with liquid keratin that helps in volumizing your hair. It contains liquidized sea-collagen that reconstructs damaged tresses by repairing dry strands and split ends, without weighing down your hair. This shampoo is perfect for over-treated hair that is fragile, limp, and dull. 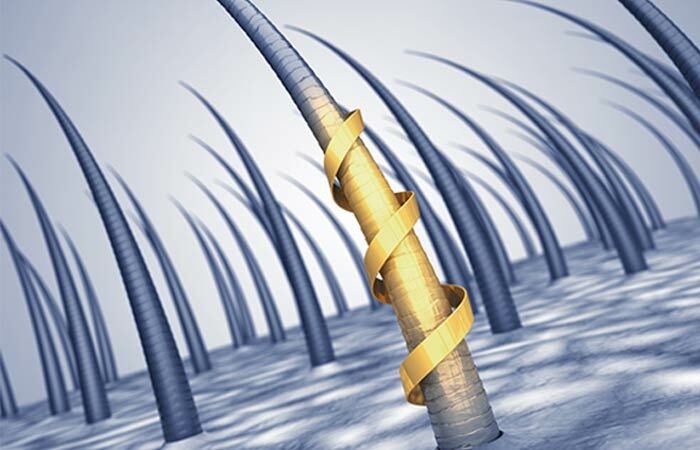 The Gliss Cell Repair System helps in strengthening the follicles from within. Are you suffering from scalp problems? 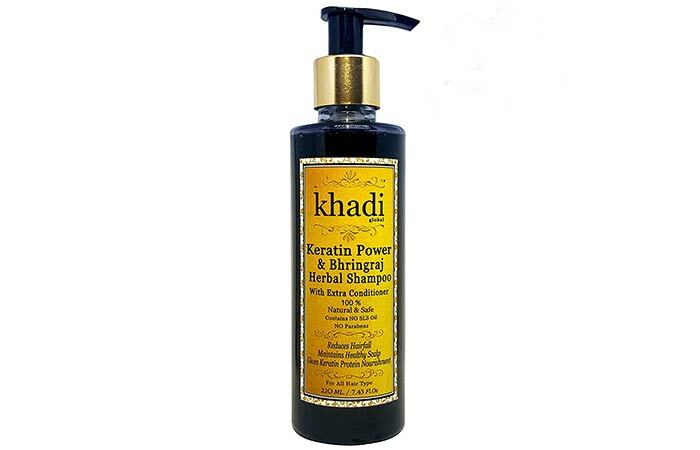 Try Khadi Global Keratin Power Shampoo that replenishes your scalp and promotes healthy hair growth. It strengthens your roots and deeply conditions damaged tresses. This shampoo claims to curb hair- and scalp-related problems like hair fall, dandruff, premature graying, and split ends. With 100% natural ingredients, this shampoo promises to give you long, luscious hair. 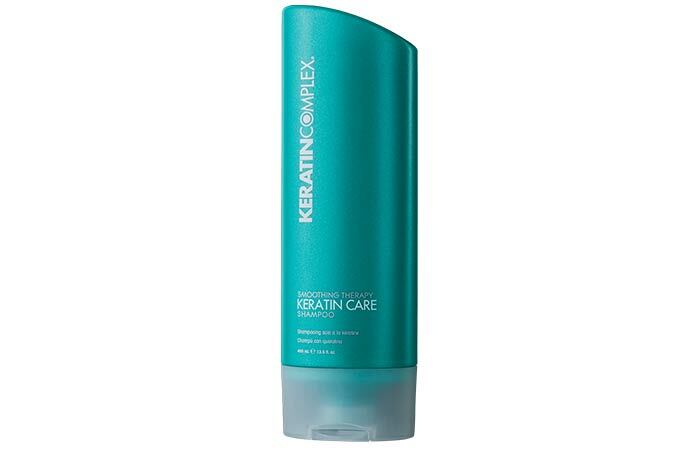 The keratin complex protects your hair from damage and breakage and strengthens it from within. 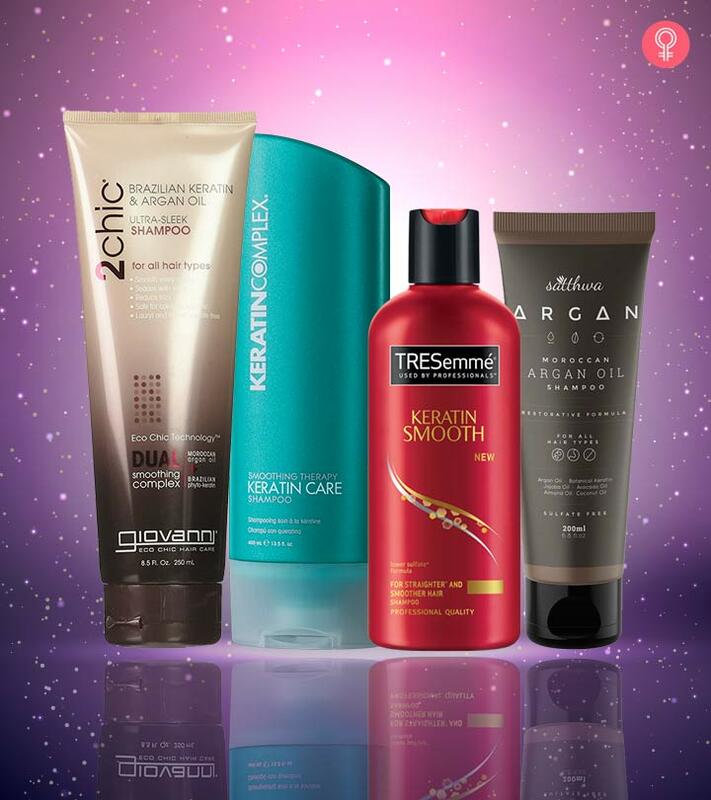 Those were our picks of the best keratin shampoos available in the market right now. Try them out and let us know about your experience in the comments section below! A good diet plays just as important a role as a good hair care routine when it comes to hair growth. We need amino acids to maintain our hair’s health and boost hair growth. Read on to find out how amino acids for hair growth work.